Most of us think of DVD software when we think of CyberLink, but the company is now branching out to show off the PowerCinema 6 HTPC software. It handles TV, Photos, Music etc as you would expect and includes H.264 support as well. Nothing here is going to peel away current HTPC customers from SageTV, Vista Media Center or the others, but they're likely targeting those new to the HTPC world anyway. 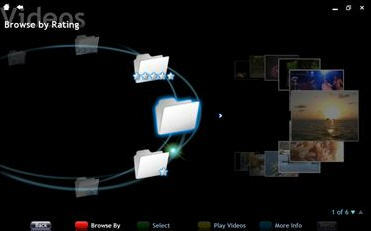 You can view the Flash Video Overview here to get an idea of the User Interface and features of the CyberLink software. I'd normally tell you to just skip the promo video, but one thing that I really liked in the interface was the Photo Slideshow - they called it "cell-style" slideshow. Its fairly simple, but showed the photos in a tiled format with multiple photos on the screen and transitioned one photo on the screen at a time. Something simple, but would work very nicely on a HD TV set. The software can be acquired right now for between $49.95 and $129.95 depending on the bundle you choose.